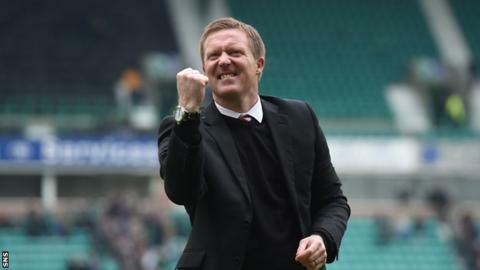 Gary Locke hopes to learn next week whether he will remain as Hearts manager next season. Prospective owner Ann Budge aims to take control of the club, ahead of a decision on the manager's future. Hearts are preparing for life in the Championship following their relegation from the Premiership. Locke, who is out of contract at the end of the season, said: "Hopefully things will get moving shortly and we'll get our futures sorted out." Locke, the former midfielder with Hearts, Bradford City and Kilmarnock, returned to Tynecastle in 2010 as first-team coach under Jim Jefferies. He took charge of the team in February 2013 following John McGlynn's departure. Despite seeing his side relegated, midfielder Ryan Stevenson said Locke deserves "a crack" at trying to guide Hearts back to the Premiership. Meanwhile, Locke has expressed surprise at the speculation over the future of St Mirren boss Danny Lennon. Lennon's future is being discussed by the St Mirren board but Locke insists he is the man for the job. "He has kept them in the league again, won them a trophy last season, what more can Danny do? "If St Mirren had been relegated, you could understand it. But he has secured their safety and if you are being realistic, keeping St Mirren in the Premiership is a fantastic achievement. "As well as that, they had that great run to the final where they beat us last year. Allied to that, they have brought through some great young players too. "I just find it all baffling."